Our Virtual Private Cloud is built on OpenStack. 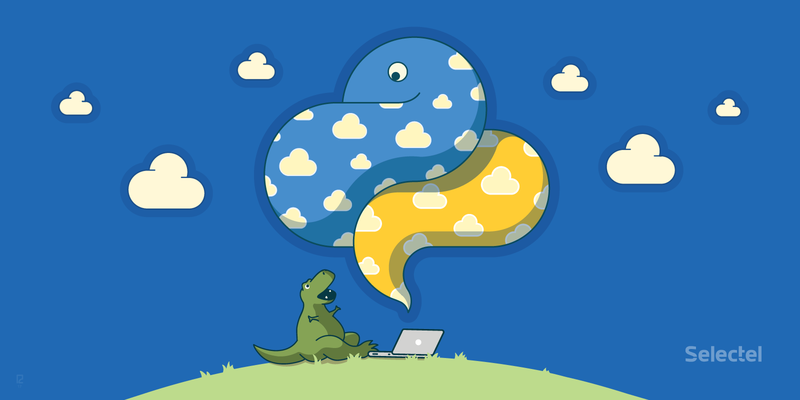 The initial cloud setup and several types of objects can be managed from our API. To make our service even easier to use, we’ve developed the selvpcclient library. The library is written in Python and covers the entire API, which lets you manage projects, quotas, and resources from your program code and console. Obtain an API token for accessing the cloud (the key should follow the format xxxxvGBYVXcQ3q86zQCGxgvk_42069). Obtain the current API URL (for example: https://api.selectel.ru/vpc/resell/vs2). Note: The API URL and version will be shown separately! This will create a “Project” object class, which contains helper methods (delete, update, etc.). The library is packaged with the selvpc console application, which is based on python-cliff, a console app framework. To manage your cloud from the console app, you need an API URL and token. There are two ways that the console app can obtain these: from the respective SEL_URL and SEL_TOKEN environment variables or from call arguments (–url and –token). Note: The library is configured to work with API ver. 2, SEL_API_VERSION by default / -api-version doesn’t need to be given. Note: If information is given in both an argument and environment variable, priority will be given to the argument. The asterisk (*) should be replaced by the object name: project, user, role, floatingip, subnet, vrrp, license. Let’s take a detailed look at how we can use the console client to create a virtual machine. selvpc project create -n "another-project"
selvpc user create --name "T-Rex" --password "c1017e8c8fd14b7e8057618a882240df"
For our new machine, we’ll allocate 1 vCPU, 512 MB RAM, and 5 GB of disk space. To manage our cloud from the OpenStack client, we have to log in. To make this easier for our users, RC files (scripts that the console can use to authenticate in Identity API v3) can be downloaded from the control panel. Note: In the original script, the OS_PASSWORD variable will not contain a password, since it’s initialized for demonstrative purposes. Never give your password to anyone! In this example, we’ll be using an Ubuntu 16.04 LTS 64-bit image. To create a machine, we’ll need a flavor (machine configuration). openstack server create --wait --volume "f79c0d35-f54c-4b6a-82ad-1764e425eec8" --flavor "006f7e84-f957-4764-a3a7-db8575c54ba7" "server-1"
Note: If you have multiple subnets in a project, you’ll have to specify which subnet should be used when creating your virtual machine. openstack server create --wait --volume "f79c0d35-f54c-4b6a-82ad-1764e425eec8" --flavor "006f7e84-f957-4764-a3a7-db8575c54ba7" --network a220c08e-a63f-48b8-aca5-563136ee9131 "server-1"
If you have any questions, please write them in the comments below. If you’ve run into any problems using the library or want to change anything, you can open an issue. Note: the current library version at the time of writing this article – 1.0.